1 Remember your creator in the days of your youth, before the days of trouble come, and the years draw near when you will say, “I have no pleasure in them”; 2 before the sun and the light and the moon and the stars are darkened and the clouds return with the rain; 3 in the day when the guards of the house tremble, and the strong men are bent, and the women who grind cease working because they are few, and those who look through the windows see dimly; 4 when the doors on the street are shut, and the sound of the grinding is low, and one rises up at the sound of a bird, and all the daughters of song are brought low; 5 when one is afraid of heights, and terrors are in the road; the almond tree blossoms, the grasshopper drags itself along and desire fails; because all must go to their eternal home, and the mourners will go about the streets; 6 before the silver cord is snapped, and the golden bowl is broken, and the pitcher is broken at the fountain, and the wheel broken at the cistern, 7 and the dust returns to the earth as it was, and the breath returns to God who gave it. 8 Vanity of vanities, says the Teacher; all is vanity. So now we come to the end of things and at the end of things is growing old and death. The final eight verses either talk metaphorically about the aging of the individual or directly about the collapse of a city or town. I read this metaphorically and at the end of all things is the gradual process of letting go that comes with old age, diminished health and eventually mortality. One of my nonagenarians from a previous congregation who had a spry sense of humor even in the midst of her failing vision and health would remind me when I would visit her that, “Old age isn’t for sissies” and that “they can call these the golden years but it must be fool’s gold.” Ecclesiastes has no place for a sentimentalism about how things will be better in some great by and by in the afterlife, it only has place for that which it can see. Perhaps there is an uneasiness with the somewhat agnostic perspective that Ecclesiastes seems to portray at certain points, its willingness to question what many people would rather overlook. Yet, looking at the world through the lens of a person who is willing to call much of what they see ‘vanity’ doesn’t lead the Teacher to desperation but instead a greater sense of peace in the moment. It allows them to counsel their pupils to embrace their youth, to remember the creator of this time and not to rush forward into the responsibility and diminishment of old age. In a culture where old age was valued and youth was not Ecclesiastes was an unusual voice. In our culture where youth is valued and old age is considered a burden and death is to be avoided at all cost perhaps the honesty of Ecclesiastes might help us with our own vain struggles against our mortality. One of the greatest gifts I think Ecclesiastes brings to things is the wisdom of appreciating the gifts of the day. We can struggle against our mortality and against our limits but they make the time we have precious. Health, wealth, relationships, fame and power may all be transitory but the gift comes in being able to find joy in one’s food and drink, relationships, toil and the work of one’s hands and mind. Vanity of vanities, all may be vanity but that doesn’t have to be a source of struggle. Instead we can be freed to enjoy the day that our creator has made and to indeed be glad in it. 9 Besides being wise, the Teacher also taught the people knowledge, weighing and studying and arranging many proverbs. 10 The Teacher sought to find pleasing words, and he wrote words of truth plainly. 11 The sayings of the wise are like goads, and like nails firmly fixed are the collected sayings that are given by one shepherd. 12 Of anything beyond these, my child, beware. Of making many books there is no end, and much study is a weariness of the flesh. 13 The end of the matter; all has been heard. Fear God, and keep his commandments; for that is the whole duty of everyone. 14 For God will bring every deed into judgment, including every secret thing, whether good or evil. The voice shifts suddenly to one talking about the Teacher rather than one talking as the Teacher. This short book was one that barely made it into the canon of Scriptures because it is a very different voice. Here an appreciative epilogue is offered which closes Ecclesiastes as we have it. It evaluates what has come before as both plainly truthful but also pleasing in its composition. That perhaps is a challenge for anyone trying to speak or write in a way that can speak the truth to the best of their ability but also not in a callous or judgmental way. Ecclesiastes writes about some uncomfortable truths and as Ellen Davis can comment, “who in our culture has the moral authority and the imagination to make uncomfortable words heard in the public forum? Few teachers or clergy, even fewer politicians.” (Davis, 2000, p. 226) Yet truth, perhaps most of all the uncomfortable truth that is skipped over in the soundbites and marketing strategies, is needed for both the individual and the public’s life. Perhaps it is great vanity writing about a book that can claim ‘Of making many books there is no end, and much study is a weariness of the flesh.’ But there has been enjoyment in the toil and a sense of satisfaction coming to the end of these reflections upon this irreverent little piece of the scriptures. Fearing God may be the beginning of wisdom as Proverbs 1:7 can state and here is one of the few times Ecclesiastes sings in harmony with its neighbor in the scriptures. Yet, perhaps it would be vanity to worry about how God will judge this deed in the end and so for me too this is the end of the matter. Vanity or wisdom or both it is done and I go to enjoy the rest of this day that God has provided. 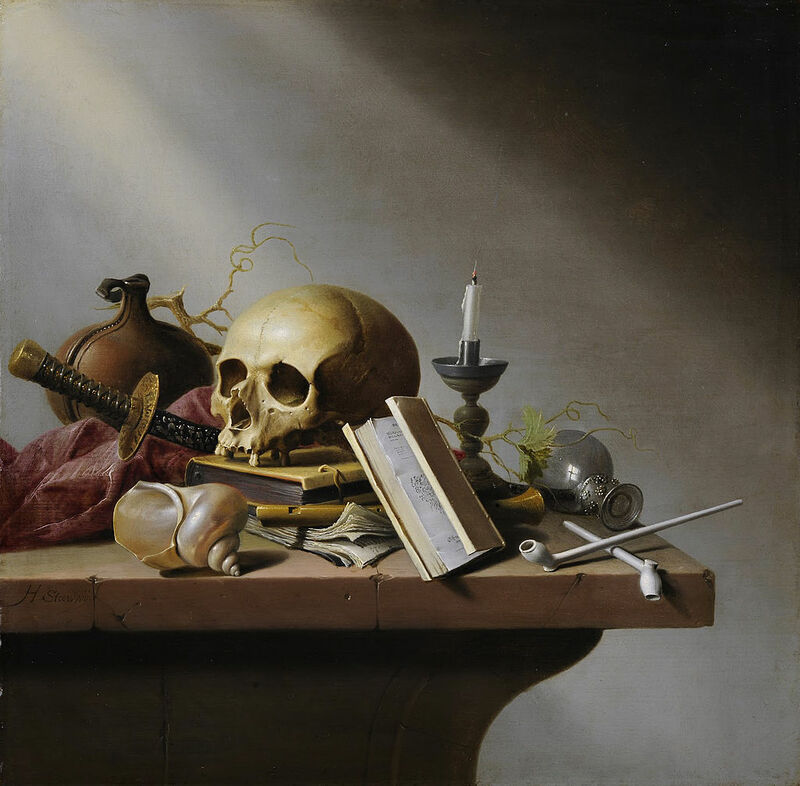 This entry was posted in Biblical Reflections, Ecclesiastes and tagged Death, Ecclesiastes, Ecclesiastes 12, mortality, wisdom. Bookmark the permalink.